During the “primary rut” of mid September to mid October, gear up to fly in for a 7 day, fully guided and outfitted hunt from a remote, wilderness camp located in the Caribou Mountains, a prime area with no hunting pressure. River and lake systems provide our hunting opportunities in an area that has huge trophy potential. Clients will find camp comfortable but spartan as everything comes in via air transport, but wood heated wall tents, delicious meals, canoe and boat transport and amazing scenery await! Experienced professionals will guide you during your hunting adventure in a place few have seen, and the monster bulls live out their days isolated from all human development. 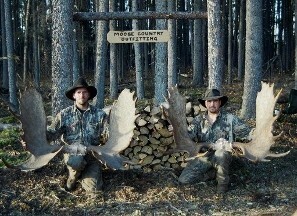 This hunt, located in the middle of “moose country”, offers incredible adventure and hunting opportunity in uncharted wilderness. Black Bear can be added to the Rut hunt to make a significant combination hunt, and Timber Wolf is always included.